It appears as if homeowners across the country have begun to realize their garage door doesn't only provide an access to their garage but also plays an important role in how their home exterior looks and how strong its curb appeal is. Maybe you've noticed an increase in presence of carriage house style doors around the block, a trend indicative of this notion. So what exactly are these and why should you consider installing one yourself? Adorned with delicate woodwork forming planking in a variety of patterns, carriage house garage doors provide a sophisticated, vintage look set to turn the heads of your neighbors when they walk by. The large handles and window inserts come in various shapes and styles and show the homeowner has an eye for interesting design. For example, if you're selling your home, a potential buyer might wonder what else has a unique touch around your house. 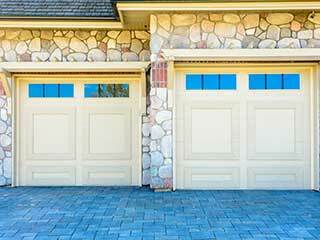 What's so great about modern carriage house garage doors is their compatibility with all current overhead systems. Some homeowners tend to think they are synonymous with other swing-out wooden doors out there, but they'd be surprised to know you can work them via a remote just like any other regular door on the market. You basically get the same convenience as you would with a standard wooden door but with a more stylish appearance. In addition, customization options from material choice to insulation are all available as per usual. As mentioned above, you have complete freedom in choosing from an array of colors, materials, features, and sizes to match your existing architecture. If you are after a little guidance, give our team of professionals at Garage Door Repair Lake Mary a call to discuss your options with a specialist. You ought to think about the correct fit for your exterior design and a viable color match. Moreover, certain features such as windows and handles can also play a major role in the way your door looks and functions.